Lingua Franca Spotted On The Red Carpet And We're FUHReaking Out! Elisabeth Moss (from my fav TV show "The Handmaid's Tale" with Connie Britton (my new favorite actress to ever walk a red carpet.ever. ), at last night's Golden Globes. Clothing can really be powerful! Who knew? If you would have told me a year ago that I would be the owner of a women led fashion company, worn by actresses on red carpets I would have laughed out loud. For real. I never really "got" the fashion world. I found a lot of it crass and meaningless. 'Fashion' was something socialites and rich UES women fussed over. I moved to NYC fifteen years ago from Lincoln, Nebraska and wanted to change the world, not become obsessed with the frivolous side of Manhattan's elite. Over the last two years, I started studying the history of fashion, the meaning it's had in cultures over thousands of centuries, the relation to the art world, the business it creates, and also, the POWERFUL effect it has had on social movements. And guess what? I've totally drank it's kool aid. Yes, I've also learned there is a lot of bad in the industry (did you know fashion is the second worst industry contributing to pollution after oil and gas?!). But, I am hopeful for the future, and excited to be in this industry providing jobs to a diverse group of women but also, using my voice in hope of impacting change. I believe in the power of fashion to help drive change. What a moment it was last night to see all of Hollywood dressed in black in solidarity for women's rights around the world! Was it a group of elites who may never know 'real women's' struggles? Maybe. But maybe it was also just a group of powerful creative people who are using their voices with love and hope and earnestness. It was a moment that we will talk about decades from now in Hollywood and beyond, and the fact that LF had a small part in it made my everything. THANK YOU CONNIE BRITTON!!!!!! 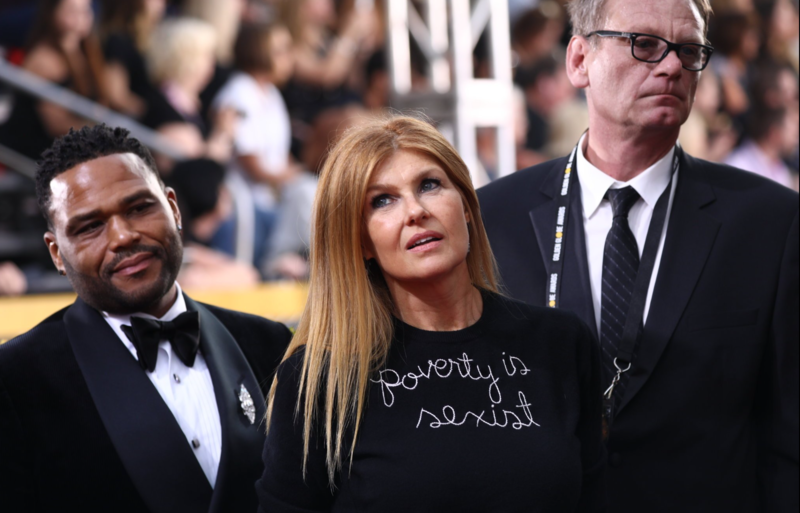 Connie wore this specific custom sweater to bring awareness to ONE campaign's "Poverty is Sexist" campaign, which aims to put a stop to extreme poverty by breaking down the barriers holding girls and women back. The data shows that women and girls in developing countries are hit hardest by extreme poverty and helping them thrive is the most effective way to lift everyone out. Time's Up Sweaters are HERE! Shout out to Celebs who get it! Like Kristen Bell who instagramed from home last night in her custom LF: " Staying in tonight but wearing black with all my sisters!" Email us to custom your own sweater! We're in the process of stitching this sweater now, and sources say it could be more than an instagram meme! Please run Oprah! Everyone has a voice - thank you women of Hollywood for you using yours last night!